Stars are a sociable bunch, by and large. They don’t like to be alone: some hang out in pairs, or sometimes in small groups of three or four. 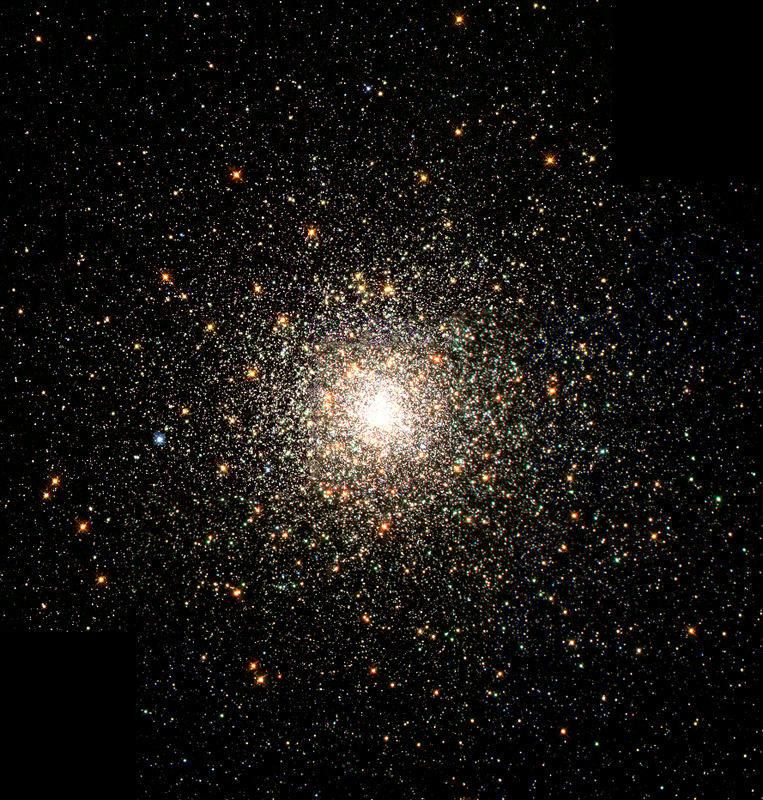 Others still are extreme extroverts, keeping company with hundreds of thousands of other stars, for example in densely packed globular clusters (GCs) – see figure 1 for an example. This isn’t be the first article on star clusters to feature on astrobites – and you can be pretty sure it won’t be the last. After all, we’ve been studying them since the seventeenth century and people are still publishing papers about them! So what makes GCs interesting? Well, historically they have been billed as windows into star formation. The theory goes as follows: take a big cloud of gas and allow it collapse under its own gravity. As it collapses, turbulence in the cloud will cause it to fragment into many much smaller bits, each of which will collapse separately. These fragments will continue to collapse, becoming denser and hotter, eventually transforming into stars. However, the whole system remains bound together by its own gravity. Other than the loss of a few stars here and there, this single group of stars will be preserved as if in aspic up to the present day. GCs in our own Milky Way galaxy formed very early in the life of the universe – indeed, they formed so early that they led to great consternation in the 1980s, when the best estimates for the age of the universe leaned a bit too young. For a while it seemed as though some GCs pre-dated the Big Bang! With this issue cleared up, it seemed as though our understanding of GCs was rock solid: everything pointed towards them being a single generation of stars, formed at the same time from one giant gas cloud. That makes them perfect laboratories for testing theories of stellar evolution – the physics of how stars change over their lifetimes as they burn up all their fuel. The classical tool for investigating stellar evolution is the colour-magnitude diagram, sometimes called the Hertzsprung-Russell diagram. Newly-formed stars obey a tight relationship between their brightness (‘magnitude‘) and surface temperature, which determines their colour (just as, for example, a lump of metal heated in a furnace will – as the temperature goes up – first glow red-hot, then orange, then yellow…). You may have heard this referred to as the main sequence. But stars don’t stay the same forever. The brighter the star, the faster its burns through its fuel. As a star runs out of hydrogen fuel, it evolves off the main sequence: physically, it swells up to many times its original size and becomes much brighter, while the diffuse outer layers cool down as they retreat from the hot core. After some given time, all the stars above a certain mass will peel away from the main sequence in the colour-magnitude diagram. The most massive star remaining marks the main sequence turnoff, or MSTO. 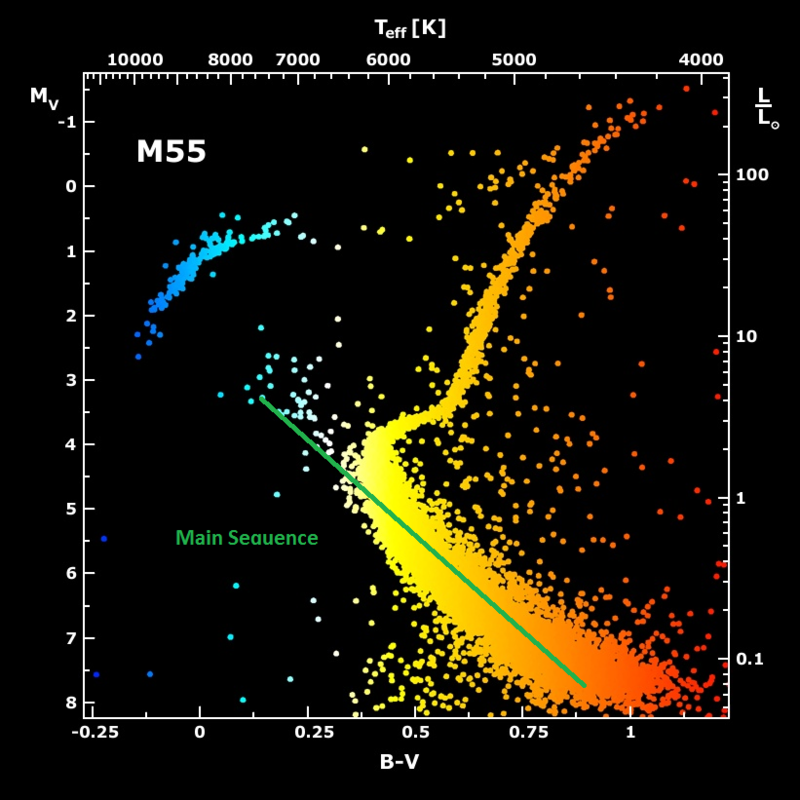 This relationship between stellar age and maximum main sequence mass means that the location of the MSTO can be used to estimate the age of a group of stars that all formed simultaneously. An example is shown in figure 2. It turns out that when you look a bit closer, globular clusters don’t actually seem to be a single population of stars that formed at the same time. Very accurate measurements of luminosity and surface temperature reveal that often there are multiple ‘main sequences’ with different turnoffs (and hence ages). Follow-up work using spectroscopy reveals that these distinct populations also have different chemical compositions. 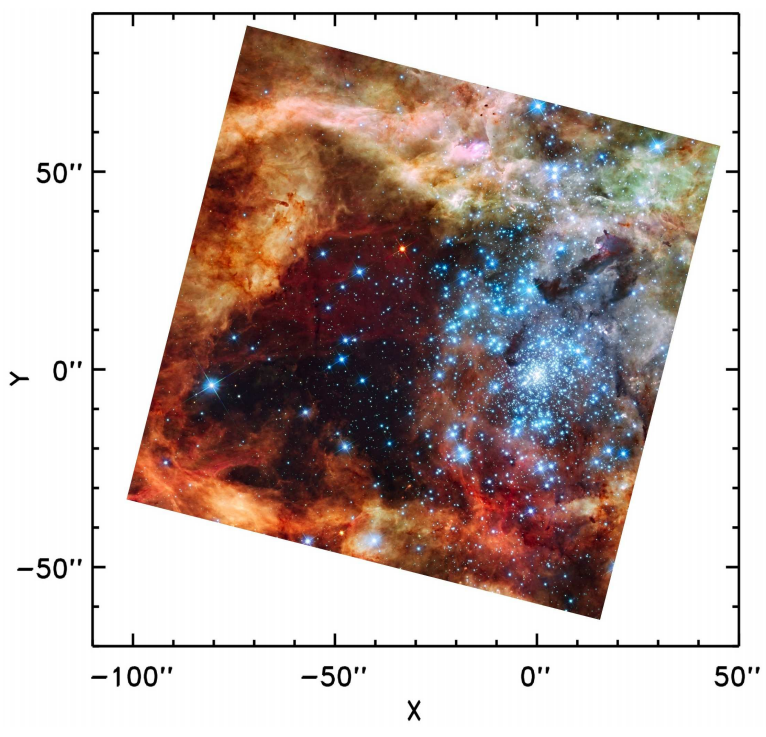 Initially, this was thought to be evidence for multiple generations of star formation in GCs, with material from the first supernovae being recycled into new stars, but this explanation doesn’t seem to fit the facts. The mechanism for forming multiple populations in one cluster remains a genuine astrophysical mystery, with no completely satisfactory model yet existing. It would be nice if I could clear the mystery up today in my review of this paper, but unfortunately that’s not how things go, most of the time. In this situation, the best thing for the scientist to do is to get more data. And that’s just what the authors of today’s paper have done. While GCs in the Milky Way galaxy formed a very long time ago, it’s actually possible to look at much younger, related systems in the nearby Large Magellanic Cloud (LMC) – a potentially useful line of attack. Just like the Milky Way GCs, these younger clusters don’t have a sharp MSTO as expected for a single population. The authors of today’s paper have pooled data from two approaches – the photometric (literally, ‘measurement of light’) approach of constructing high-quality colour-magnitude diagrams and the spectroscopic approach of measuring how the cluster’s total brightness varies with wavelength. Because clusters in the LMC are further away than those in our own galaxy, a lot of the fainter stars are unresolved (and hence don’t appear on the color-magnitude diagram, because we can’t see them); the spectroscopic approach nonetheless gathers up the light from all the stars, so it’s a useful complement to the photometric approach. In fact, the authors’ principle finding is that the spectroscopic data appear to indicate a much larger contribution to the cluster’s light from unresolved red supergiant stars than that expected from our best models. This is a bit of a challenge to the models, which, taken at face-value, do suggest that these clusters indeed host multiple populations of stars, formed millions of years apart. Hopefully future improvements to the models will help clear things up a bit! While the mystery of multiple populations is by no means solved, today’s paper brings us one step closer.